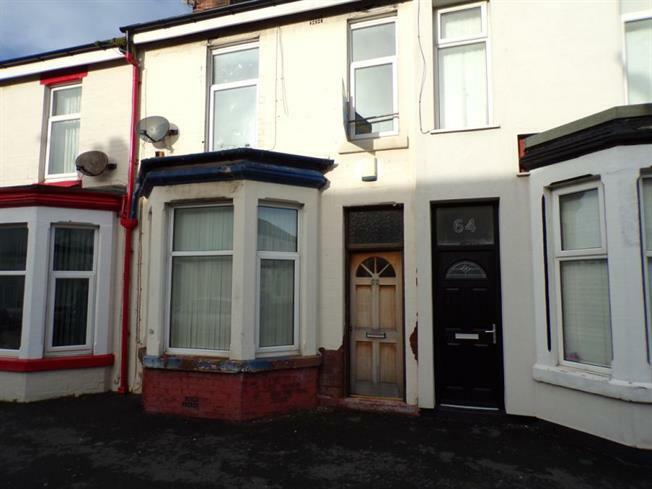 2 Bedroom House For Sale in Blackpool for £60,000. Well presented Mid Terraced property. Walking distance to local shops and amenities. The spacious accomodation comprises two double bedrooms, two reception rooms, modern fitted kitchen with bathroom and seperate WC. Benefits from gas central heating, double glazing and enclosed yard to rear. Would make fantastic buy to let investment or first time buy. Feature fireplace with living flame gas fire. Double glazed window and central heating radiator. Modern fitted kitchen providing wall and base units. Stainless steel sink with mixer tap. Space for oven and washing machine. Double glazed windows to side and rea and central heating radiator. Double room with two double glazed windows to front and central heating radiator. Double glazed window to rear and central heating radiator. Cupboard housing boiler. Bath with shower over, Pedestal wash basin.Built in storage cupboard. Double glazed window to rear. Low flush WC. Double glazed window to side. Enclosed yard with gated access to rear.